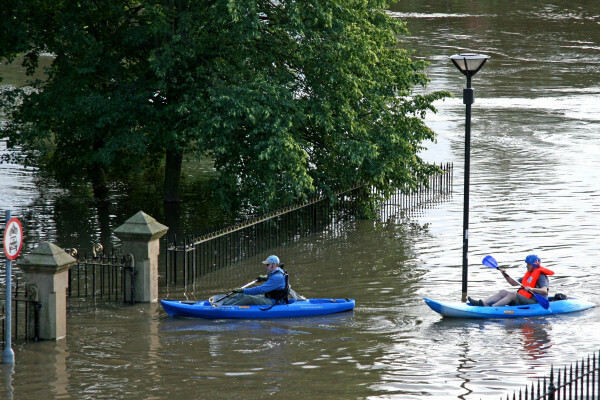 Britain's continuing wet weather has highlighted a serious problem facing towns and cities - urban flooding. Rather than soaking through the soil, water in built up areas is blocked by concrete, tarmac and tile and can overwhelm the drains and flood. But there is an alternative, at least in some areas - SUDS or Sustainable Drainage Systems, with some neat ideas for urban planners. Rachel - SUDS try to mimic the natural conditions that you would get in a hydrological system, so we're trying to store that water in the catchment instead of allowing it to flow quickly downhill. So there are a few ways we can do this. The most natural scenario is that water infiltrates straight into the ground. Where this can't happen, because the ground is not permeable enough, naturally that water would collect in ponds, in depressions and slowly that would then either infiltrate into the ground or it would flow in water courses through the catchments, but importantly we don't get these really intense flows usually in natural environment - this is really only an urban phenomena. Richard - And one of the ideas is the idea of permeable pavements, of having a hard surface but that the water can flow through. Richard - We're on a bit of grass here and it's just muddy and horrible. Rachel - It's quite muddy and horrible and in here you would try pretty hard to focus any recharge, any rainwater, into the ground and in a place like this maybe you can install an infiltration basin that actually provides storage on the surface and therefore allowing that water to infiltrate very slowly, but actually what we choose here when we designed our new buildings - behind us is a rainwater harvesting system. So rainwater is harvested on our roofs and it is used to flush our toilets and this is a good example of a sustainable drainage system which doesn't involve the ground so we can install sustainable drainage systems absolutely anywhere. It's just that in some places we can infiltrate to the ground and in other places we really should focus on either storing water on the surface or re-using it. Richard - Could you retrofit these sorts of systems? Rachel - Certainly retrofitting is a big area of interest. In cities, when we regenerate areas, can we possibly put in sustainable drainage systems and there's a real space issue here. So trying to find space for an infiltration basin is really quite difficult in urban areas. But, still, we can do things like put in permeable pavements, for example, instead of hard road surfaces, rainwater harvesting, there's always options. Richard - And you've actually put together a map of where this would work in the UK and where it wouldn't work in the UK? Rachel - Not exactly, but almost. We've created what we call an infiltration SUDS map and this map shows you what the properties of the ground are. So we cannot say "here you can install a soak away" or "here you can install an infiltration basin" because it very much depends on the design of the actual system. So, what is the surface area of the system, what is its volume. But we can tell you have permeable the ground is, whether you're on a flood plain and whether the ground water is likely to be very shallow, whether if you put water in the ground it is going to cause the ground stability problem or you could impact ground water quality. And so the map gives you data that tells you all about these considerations so that you can then go away and make a decision about what sort of system might be appropriate. Richard - But are there imperatives for people to do this, for builders, for planners, for architects, engineers to take these sorts of things into account? Rachel - So the case with retrofitting is less clear but certainly for new builds there's a new legislation called 'The Floods and Water Management Act' and this requires that developers must consider using sustainable drainage instead of connecting to the drainage network. This legislation hasn't been implemented yet but when it has been it will mean that developers must prioritise the use of infiltration to the ground, so they must consider the properties of the ground and they must consider using - infiltration is the most natural and sustainable drainage system. If that's not possible because of the properties of the ground they then must consider storing water on the surface in infiltration basins, for example, and if that's not possible then they may consider putting water into the drainage network. But the key thing is the right for them to connect to the drainage network is not necessarily going to be there in the future and they are going to have to think about other ways to solve this problem.